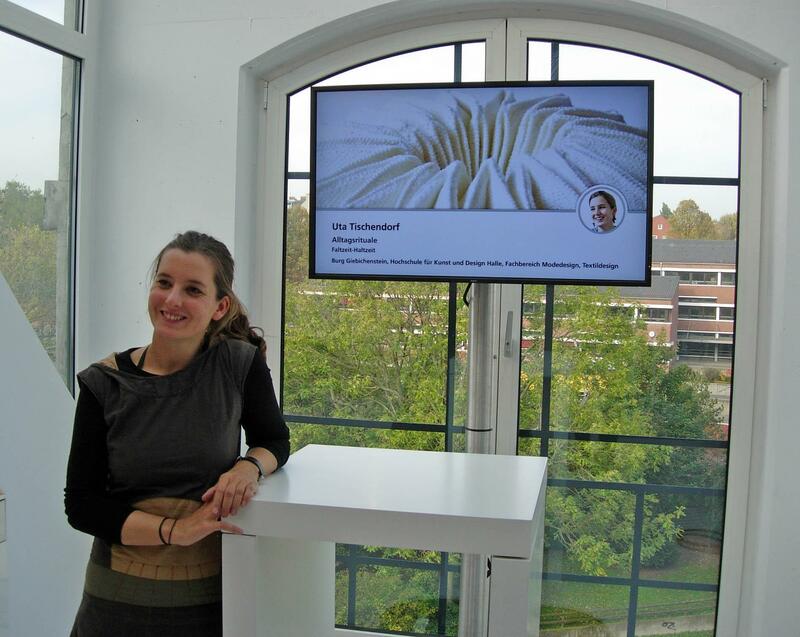 Uta Tischendorf is a 31-year-old textile designer and graphic artist, who enjoys playing the cello in her free time. She lives in Berlin and rounded off her 7-year study of textile design in early 2012 by graduating from the Burg Giebichenstein University of Art and Design in Halle, Germany, with a Master's degree in Conceptual Textile Design. Before that, she had studied at ESAAT (École Supérieure des Arts appliqués) in the French town of Roubaix from 2007 to 2008. She learned a lot during this whole period and worked on a number of impressive projects, including two at the Audax Textile Museum in the Dutch town of Tilburg. She has been working for Johnson Controls GmbH in Berlin, the German branch of a multinational company with a wide range of products and services, since October 2012. Johnson Controls is a leading supplier of fabrics used to cover car seats and door panels among other things; this is the field in which Uta specialises. She also holds exhibitions of her own work in Germany and Holland, sometimes together with orther members of her artistic family. "I am still fascinated by textiles," she says. "I believe I can express myself by playing with the material and seeing what comes out in the end, what it repays me for the effort I put in. It is like food for my mind, my soul, my self. It's more than a hobby, more than a profession: it's my life...I can't live without it ...I use textiles to communicate my ideas and feelings to others. I grew up in an artistic family: my parents gave me the opportunity to play with different materials such as clay, wood and textiles when I was a child. I also helped them in their work, such as the restoration of old buildings and paintings. We used to draw togehter too. In fact, my parents taught me everything I know about art. I find it fascinating to transform and combine different materials to create something new." One of Uta Tischendorf's most impressive pieces of work was the final project for her Bachelor of Art degree in 2011, entitled 'Everyday Rituals: Folding Time - Halting Time', meaning breaking loose from everyday rituals. This earned her a special recognition by the 2011 Lucky Strike Junior Design Award, the iFconcept design award , the 2012 Bavarian State Prize and a nomination for the Saxon Award. Uta was a fourth-year student at the University of Art and Design in Halle at the time, and she was serving an internship at the Audax Textile Museum in Tilburg during this project. "I wanted to develop knitted fabrics based on the principles of the Japanese paper-folding art of origami, that could be used to create a personal space to which one could withdraw to find inner peace," she explains. For this project Uta received a nomination in 2012 by the Bavarian State Prize and also the Saxon State Prize. This project arose from the idea of making a flexible textile covering for the human body, proving an interface with the outside world and a centre of rest in day-to-day life. Uta was fascinated by the interplay of big and small in this context, which she saw as the ideal basis for creating a 'space within a space', and by the image of putting the textile covering on and taking it off like an extra skin. The project was based on new developments in knitting technology, realised in cooperation with the Audax Textile Museum Tilburg. 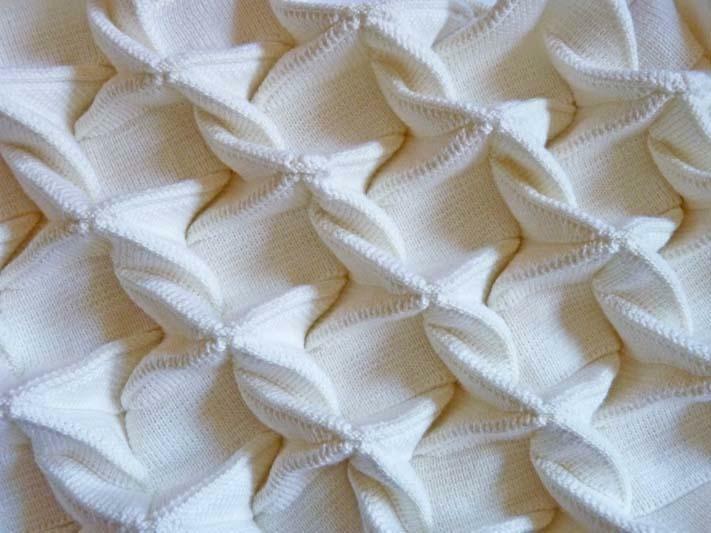 "The translation of the folding techniques used in the Japanese art of origami into knitted textiles, called for intensive study of the interaction between yarns and knitting patterns," Uta explains. 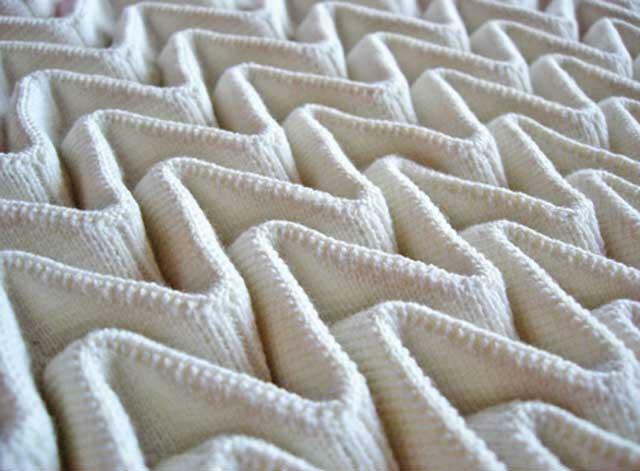 "These fabrics are extraordinarily complex three-dimensional knits. The basic structures of origami were built into them with the aid of sophisticated stitches and long-lasting material combinations, leading in the course of the design process to mature production software with optimal technical parameters for the knitting machine used to produce the fabric and yielding textile products with the necessary durability, flexibility and built-in memory function. The fabrics developed can be folded in a wide variety of different ways, providing the basis for innovative textile materials and multifunctional applications such as hanging partitions, lampshades and fashion accessories. They create an atmosphere in which people feel much freer and less dependent on everyday rituals. The knitting technique and the materials used become much more important. 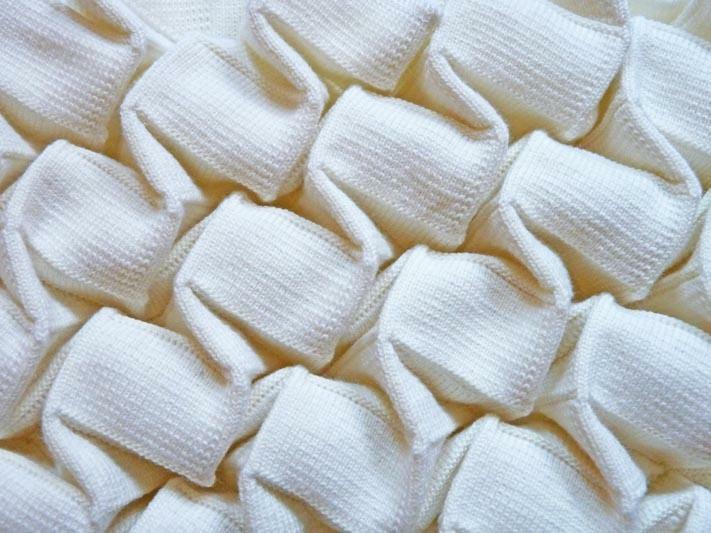 I knitted these three-dimensional fabrics myself, and deliberately chose the colour white for them since the use of the white colour in combination with this technique gives the textile another quality. It isn't just a simple textile, which you just hold in your hand, it's more than this, it's a textile to discover, to play with, to feel, to express yourself with. I am not a fashion designer however, but a textile designer, and I see it as an important part of my task to develop new parameters for the textile industry." This folded knit is based on technical innovation: no one has ever been able to fold knitted fabric so precisely before. It thus represents the interface between traditional handicraft and innovative conceptual design. She was using different materials. It makes use of geometrically arranged basic forms from conventional knitted fabrics. Knowledge of programming in M1Stoll Plus pattern software for knitting machines and intensive study of material properties and knitting techniques allowed Uta to create mature production software with optimal technical parameters that can be used on an industrial knitting machine. The folded fabrics are stronger and have a sturdier feel that traditional materials, thus facilitating their multifunctional application in interiors. À l'ombre (from French: in the shadow) is the name for a project with light and shadow which Uta did during her study in France at the Ésaat ( École Superièure des Arts Appliqués et du Textile) in Roubaix. À l'ombre has been a quiet free artistic and experimental project. Besides trying out different methods like shibori, transfer or screen printing, the focus layed on combining them. Every design student had simply the task to choose exactly the colour he didn't like to do the colorit. By using this negative procedure everyone was faced with a certain and mostly unknown field of colours and challenged - against his usual preferences - to find himself in trying out different degrees on light and dark concerning this chosen colour. Uta Tischendorf is not only inspired by Japanese art forms in her textile designs: she is also highly motivated to use a variety of colour effects in her work, and has an instinctive urge to innovate and experiment. She gave evidence of her love of colours in several previous projects in which she participated during her studies, such as the experimental project À l'ombre and Coral Reefs (see below), where the main emphasis was on playing with colours and forms from the ocean. Uta's Coral reefs project (2009-2010) demonstrated her enormous admiration for life in the ocean - a world that she described as "sensual and sensitive". She worked on it in her seventh semester at the University of Art and Design in Halle. "I did part of the work during a three-month European Textile Trainees placement in Tilburg, the Netherlands, part in the ComOn design workshop in Como, Italy, and finished it at the Burg Giebichenstein University of Art and Design in Halle. 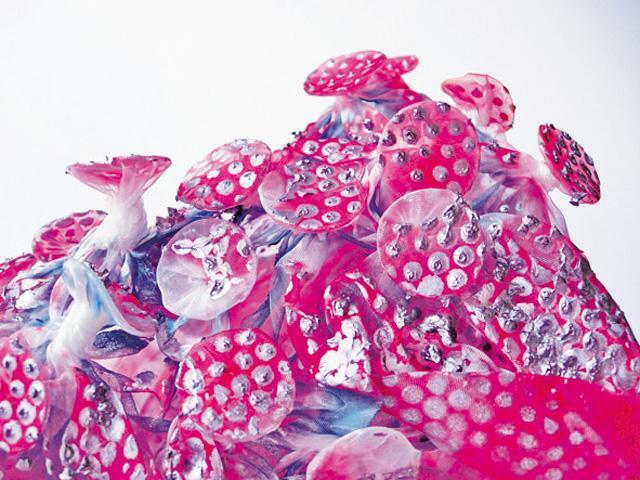 As a result, the Coral reefs collection comprises two different types of textile creations." "I started off making knits in cooperation with the Audax Textile Museum in Tilburg, experimenting with various innovative joining techniques and different materials to reflect my fascination with the astonishing diversity of life forms to be found in the sensual, sensitive world of the ocean. The second part of the collection, developed at Burg Giebichenstein, consisted of fabrics made from artificial fibres and decorated with a variety of shapes and colours by a combination of transfer printing, shibori tie-dying and thermal fixing. At the end of the design and development process I had a range of fine textile fabrics that reflected the dazzling multiformity of oceanic life. Coral reefs and all the other aspects of the oceanic world have always captivated my imagination." 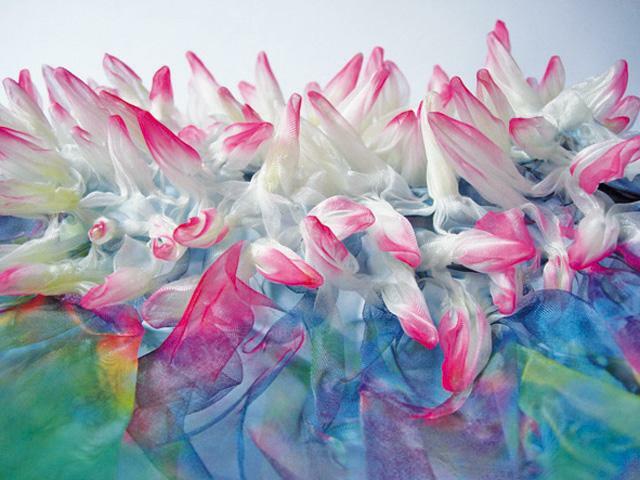 The Coral reefs collection formed the first part of the final project for Uta's Master of Art degree. These textile creations appeal both to the sense of sight and that of touch to achieve the desired results. The second part was a theoretical exploration of colour of creature, "Farbwesen oder das Wesen der Farbe." 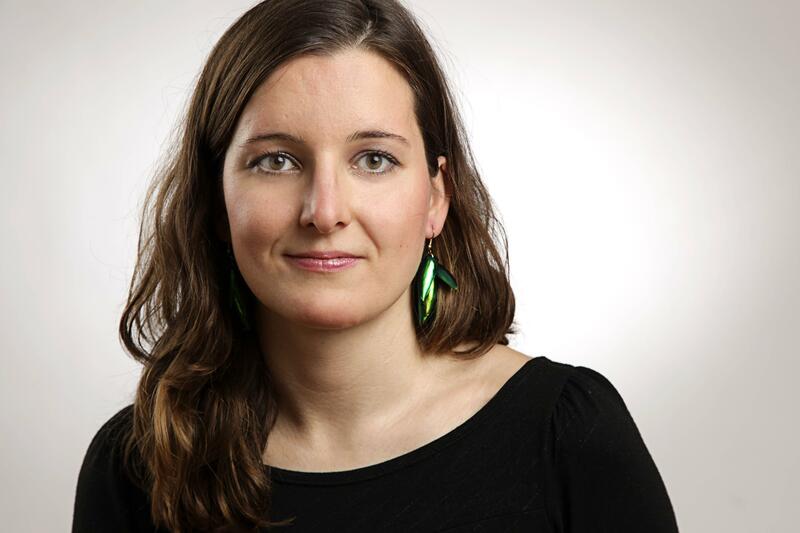 Her Master's dissertation in 2012, entitled “Farbwesen oder das Wesen der Farbe”, (Colour of creature or the creature of colour), also concentrated on issues relating to colour, in particular the different roles colour plays in survival strategies in nature. She argues that the continual changes that determine the lives of all living beings are essentially based on modification and selection. "The aspects of change I concentrate on in my dissertation," she goes on, "are a number of colour-related optical phenomena such as mimicry (colour changes that allow animals to blend in with their surroundings) and aposematism (the use of bright colours by some animals to scare off predators). The wide range of effects involved here - including variations in structure and pigmentation, colour changes, bioluminescence and phosphorescence - play a key role in ensuring the survival of various species in their habitats. My aim was to gain a broad understanding of the natural effects encountered in this field and to create a range of screen printed fabrics that would reflect this variability in a playful way."